Earlier today, a last minute penalty from Stephen Amankwah earned Berekum Arsenal FC a point against league leaders Asante Kotoko FC. Left-winger Fatau Mohammed had given the Porcupine Warriors the lead in the first half. Rashid Mutawakil (born 03.02.1986) was in goal for Berekum Arsenal FC. Mutawakil has apparently cemented his place in the team, turning veteran goalkeeper Thomas Tuah Asare (born 17.03.1984) into the reserve. The burly Mutawakil is obviously best as a shot stopper and he seemed to struggle with crosses at times. Nevertheless, he made some important saves towards the end of the match. Berekum Arsenal FC played with the same defence as in the last round against Ebusua Dwarfs; Prince Ahenkan Adjei as right-back, Akwasi Awuni as left-back and Akwasi Acheampong (born 26.03.1991) and John Afrifa (born 03.12.1993) as centre-backs. This is a very promising line-up, though inexperienced, with captain Acheampong as the natural leader. I was impressed with Adjei against Dwarfs, but today he struggled with the lively Fatau Mohammed and the Kotoko-midfielders. He was rarely seen at the flanks and failed to deliver dangerous crosses. It was also Adjei that lost Mohammed when he scored Kotoko’s goal. Awuni at the left was slightly better in my opinion, combining well with Collins Agyei Pele when the latter entered the match. Awuni is a rather tall, enthusiastic left-back who I believe is very young. Awuni should really try to improve his crosses. From my point of view, the combination between Acheampong and Afrifa could be the key to success for Arsenal this season. The way they neutralized danger man Ahmed Touré was simply impressive. I noticed yet again how comfortable Acheampong is with the ball in his feet and Afrifa, apparently playing his third game at top level, plays with such a maturity. Afrifa manages to bring the ball out of defence with great confidence. Jafar Danjuma (born 12.12.1985) played as the defensive, central midfielder. As far as I could hear, it took 89 minutes before the TV commentators mentioned his name. However, despite his anonymity I noticed that Danjuma made some important tackles. Sadiq Haji Abubakar (born 23.12.1987) partnered Danjuma in the center of the park. Abubakar was my personal man of the match in the first half, showing neat passes, creativity and some of his famous thunderous shots. However, Abubakar somewhat disappeared during the second half. Abubakar played for Ebusua Dwarfs last season but is now back at his former club. Yet again, Arsenal’s top striker James Boadu (born 24.01.1985) played in a very deep role, apparently as an attacking midfielder. Boadu had some attemts at goal, mostly from set-pieces, but he was rarely seen at the receiving end of crosses. In my opinion, this is where Boadu is at his best. Bennett Ofori (born 10.03.1989) played at the left-wing. Personally, I expect more from this quality player who seems to be out of form. At his best, Ofori is a hard-working, elegant winger with powerful runs and creative passes. Ofori was replaced with Collins Agyei Pele (born 03.03.1986). When the skillful Pele entered the game, Arsenal looked much more dangerous and his passes always seemed to have a purpose. Joseph Masel (born 08.04.1984) seemed to play as an attacking, right-sided midfielder, but both Ofori and Masel were wandering a lot, somewhat confusing to me. I have always liked Masel but today he was completely invisible from my point of view. Masel is a speedy winger who is able to break down any defence on a good day. Masel was replaced with Richard Osei Bonsu (born 18.07.1990). The attacking midfielder seems to be struggling to find his impressive form from last season. Enock Asare (born 15.05.1988) played as a striker. Asare uses his pace with great smartness and I’m really starting to like this player. Asare works hard and wanders a lot, often chasing rather hopeless passes. Asare was replaced with the experienced Stephen Amankwah (born 16.05.1983), an experienced and powerful defender / striker. Amankwah is also an expert on penalties and it was no surprise that he was picked when Arsenal won the penalty. Amankwah provided extra power up front in the last phase of the game. Asante Kotoko FC played with Abdoulaye Soulama (born 29.11.1974) between the sticks. Soulama, a former member of the Burkina Faso national football team, is most likely the oldest player in the GLO Premier League 2011-2012 and his experience is valuable. Soulama looked very confident and had a few match-winning saves. Amos Frimpong played at left-back in the absence of wonderboy Abdul Rahman Baba, who I believe was travelling with the Ghana U-20 national football team. Amos Frimpong, signed from BA Stars FC before the season, is primarily a right-back, which could explain why he had a rather quiet game. The right-back of the evening was the impressive Yaw Frimpong (born 04.12.1986) – in my opinion the best full-back in the GLO Premier League 2011-2012. Yaw Frimpong, a strongly built, modern-style right-back, is like a locomotive when he runs up and down the flank. The central defensive pair of Mohammed Awal (born 01.05.1988) and captain Henry Ohene Brenya (born 04.05.1985) looked solid enough. Awal, widely regarded as the best central defender in the local league, did however cause the penalty and at times he makes some strange decisions. When Awal becomes more experience, he will probably learn when he should tackle and when he should just use his massive physique to shield the attacker. Brenya, who has played at top level of Ghanaian football for several seasons, is a very intelligent and powerful defender who was, somewhat surprisingly, picked as the captain of the season. 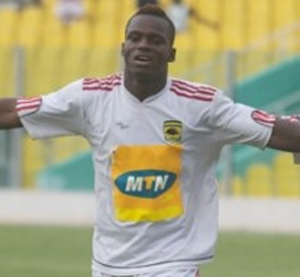 Brenya played for Berekum Arsenal FC for three seasons before joining Kotoko. Kotoko played with three midfielders; David Ofei (born 07.06.1989), Michael Akuffo (born 18.12.1985) and Daniel Nii Adjei (born 29.09.1988). Akuffo played in the central role, Ofei was a bit to the left and Adjei a bit to the right. Ofei, who was out in the cold last season, was one of the most positive surprises to me. Ofei, a creative player with intelligent passes, was also the man behind the beautiful cross that led to the goal. Ofei was replaced with the towering striker Iddrisu Nafiu (born 12.06.1986). Akuffo is the midfield dynamo and most likely the player that runs the most during a match. Akuffo has become a true key player and his working rate is top level. Adjei, known for his powerful shots and goal scoring ability, had a disappointing game by his own high standards. Adjei was replaced with the burly striker Michael Mensah, who I failed to notice the few minutes he played. Fatau Mohammed (born 10.05.1982) played as a left-winger, not the natural position for the midfielder. However, Mohammed was largely impressive and he managed several good runs inside the box, including the one that turned into the goal. Nathaniel Asamoah (born 22.02.1990), usually a striker, played as a right-winger. Asamoah is such a fast player and his powerful running caused a lot of trouble for the Arsenal-defenders. He had few shots at goal but had a good game. Asamoah was replaced with Afranie Yeboah (born 05.05.1988), the hard-tackling central midfielder. Ahmed Touré (born 17.07.1987), the Ivorian star player at Kotoko, had a difficult game as the centre forward as he was guarded by the tough central defenders of Arsenal. Nevertheless, it was Touré that got the assist when he headed the beautiful cross from Ofei onto the feet of Mohammed. Touré is such an intelligent striker and defenders may think that they have him under control, but he always manages to break loose and cause havoc. Most football experts in Ghana think Ahmed Touré is the best player in the GLO Premier League. Interestingly, Touré has stated that he considers applying for a nationality switch. He could very well become a member of the Ghana national football team during the next couple of years. The picture is of Touré and is taken from dailyguideghana.com.